Wind turbines and solar energy systems such as photovoltaic and solar thermal must operate for decades, often in extremely harsh environments and with minimal maintenance. They, therefore, require extremely durable materials as well as testing to understand their service lifetimes under a variety of environmental conditions. Static and tracking solar concentrated outdoor exposure of material samples and solar products can be performed at Atlas’ benchmark sites in South Florida and the Arizona Sonoran Desert in the USA. Static exposures are also available at Atlas Chennai, India, and Bandol, France, sites, our Hoek van Holland North Sea and Florida Keys corrosion test centers or at any of the more than twenty affiliated sites in our Worldwide Exposure Network. 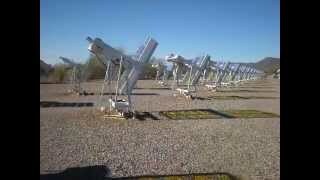 Outdoor performance and durability testing of solar thermal devices such as hot water systems and photovoltaic modules and systems are primarily performed at Atlas’ Solar Test Center at our Arizona DSET Laboratories site. Accelerated outdoor testing using solar tracking and concentrating EMMA/EMMAQUA devices is also performed at the Arizona site as is research testing using the Ultra Accelerated Weathering System co-developed with the U.S. National Renewable Energy Laboratory. Atlas specializes is designing custom durability test to meet specific client requirements. Larger scale solar thermal laboratory testing can be performed with Atlas’ Custom Test Systems metal halide solar simulation luminaires. Large scale solar/weathering exposures can be performed in large solar/climate chambers at Atlas’ Arizona lab. Materials such as coatings and polymers are weather durability tested as test coupons or plaques in Atlas Ci-Series Weather-Ometers, SUNTEST or Xenotest xenon arc artificial accelerated weathering instruments. 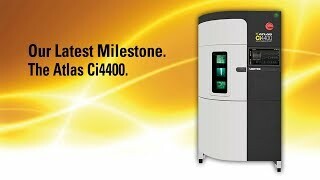 Corrosion resistance is tested in Atlas SF, BCX or CCX series salt fog/spray corrosion test chambers. Testing is typically to international standards, although custom test parameters are also used. Photovoltaic module materials such as backsheets and encapsulants are similarly tested, and full PV modules can be tested outdoors as well as in larger solar/environmental laboratory chambers at the Solar Test Center. Atlas has developed the proprietary Atlas 25+ PV Module Durability test program for assessing module durability resistance to environmental degradation.